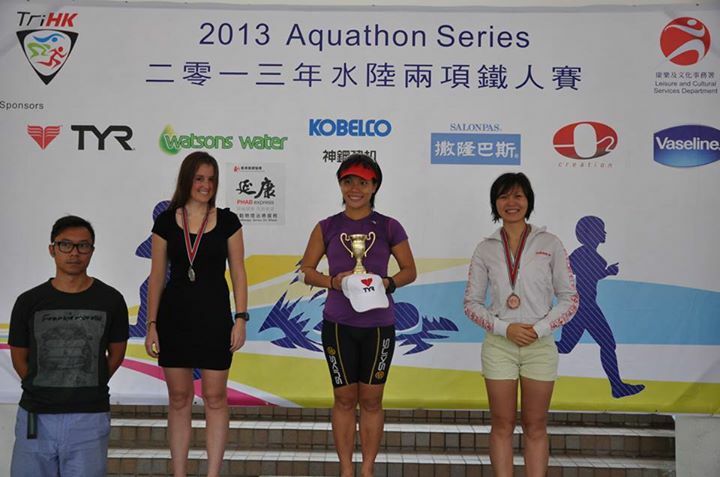 I was asked to write a race report for the Aquathon which took place on 10 November 2013, at the Gold Coast of Hong Kong. Let me give you a brief back round. I moved to Hong Kong about 6 months ago and what an experience it has been. I have met so many people from different countries and the ones I get on the best with, are the ones that have one thing in common with me, namely,they love to swim, bike, run…or all of the above! Unfortunately, not everything has been smooth sailing. The pollution has taken a major toll on my body and after getting bronchitis, which thenturned into pneumonia, I was forced toquit trainingfor a fewmonths. After a lot of tears, I finally managed to kick pneumonia to the curb and I am now ready to start tackling new challenges. I started off my post pneumonia season with a 15 km open water relay swim. I was nowhere near fit enough, butI could not let my teammates down and I had to at least do one interesting race this season. I got through the race smiling, enjoying every minute of it and with that, the racing bug got hold of me again. I had to enter the last race of the Hong Kong Triathlon Association, Aquathon Series. It was not my type of race, as it started with a run, then a swim and then a run again. I prefer the long swims and then a short run, but hey, at least I could get into my tri suit again. My race strategy was to take the race like a training session, practicing my transitions and most of all just to celebrate being healthy again. The first run was fast and furious and I could not hang onto the girls in my group, but I was feeling fine which made me happy. I forgot my game plan for transition and ended up swimming with my race belt and number on. Fail! In the swim I overtook a lot of athletes. Yes! Now there was only one run left. It was hot and humid, which made it tough, but I was happy with my performance, so I just kept on running as fast as I could until I crossed the finish line. I watched some of my friends compete, when to my surprise it was announced that I came 2nd in my age group. My day could not have been any better. Thank you Riana and Dinamic coaching for being so understanding, patient and encouraging. I have one more triathlon left for the season andI look forward to it.